For the past five years, I have been proud to co-host the Carnival of Natural Parenting with Dionna of Code Name: Mama. We created the Carnival in January 2010 to bring together the awesome community of parenting bloggers who identify as "attachment" or "natural" parents. In 2014, our writers revealed their parenting fears; they shared their family's pastimes and discussed how to balance "me time" and family time; and they offered ideas and tips on fun and frugal family vacations and on how to make the most of indoor time with kids. The compilations of posts are a rich resource — I hope you will look through 2014's themes and articles below and get to know some of the writers! Anyone can write for the Carnival of Natural Parenting, and you can write as few or as many times as you'd like throughout the year. You can read more about how to write for the Carnival as well as details on upcoming topics at our main Carnival page. Here are the topics for the next few months: In June, we'll be writing letters to ourselves; in July, we'll be sharing ideas for summer fun; and in later months we'll let our kids take over our blogs, we'll reveal some parental confessions, and we'll share traditions surrounding anniversaries. Topics are posted through January 2016 - come read more details at our main Carnival page. Whether you write for or enjoy reading the articles written for the Carnival of Natural Parenting, or whether you are simply interested in learning more about natural parenting practices, we want you to join our community at the site born out of the Carnival: Natural Parents Network (NPN). NPN is a community that connects, informs, empowers, and inspires parents and parents-to-be. We are thankful for the larger NP community we interact with on NPN's website, Facebook page, and Twitter stream, and we're doubly thankful for the close-knit family of NPN volunteers — we have found true friends. 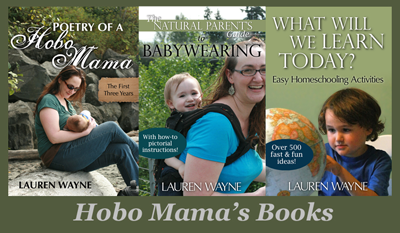 If you haven't yet, be sure to sign up for the joint newsletter of Natural Parents Network, Code Name: Mama, and Hobo Mama. And for Carnival updates, be sure to look for the #CarNatPar hashtag on Twitter and follow the Twitter list of our #CarNatPar writers. On Facebook, you can get Carnival updates by "liking" the CarNatPar Fan Page. We look forward to reading more from our writers — new and old — in 2015 and beyond. I'd like to share with you a few highlights — and a few of my favorite things — from our 2014 Carnival posts. In the 11 months that we hosted CarNatPar in 2014 (we took October off), we had 75 different writers. In addition to Dionna and me, two other author wrote all 11 months: Jorje from Momma Jorje and Jennifer from Hybrid Rasta Mama. Our next most prolific writers were Kellie from Our Mindful Life and Gretchen from That Mama Gretchen, who wrote for 9 of the 11 months. Thank you, mamas! Our most popular carnival topic was in January with 30 authors — The More Things Stay the Same. Our least popular topic was in November with 11 authors — Indoor Fun. Our authors wrote a grand total of 201 posts. January 2014: The More Things Stay the Same: Growth Happens When You Aren't Looking — Lori at TEACH through Love is treasuring these fleeting moments of her daughter's early adolescence by embracing the NOW. And in One Little Word for 2014 — Christy at Eco Journey In The Burbs has decided to focus on making things this year, which is what she loves, as long as she doesn't kill herself in the process. February 2014: Parenting Fears: An Uneasy Truce — Homeschooler and recent convert to unschooling, Tam at tinsenpup shares just a few of the things she tries to keep in mind when fear and insecurity begin to take hold. March 2014: Everyday Superheroes: It Starts With Truffula Trees And Tulips — Luschka of Diary of a First Child takes a hard look at the realities of her relationship with her mother, and through this post goes on a journey of discovery that ends in a surprise realisation for her. And Like Fire Engines — Tam at tinsenpup tells the story of the day she saw a surprising superhero lurking in the guise of her not entirely mild-mannered four-year-old daughter. And My Father, The Hero — Fathers are pretty amazing; find out why Christine at The Erudite Mom thinks hers is the bees knees. April 2014: Family Pastimes: The Fab Five - Stages so Far — Laura from Pug in the Kitchen couldn't choose just one stage for this carnival and is sharing her top five favorite stages in the young lives of her son and daughter at Natural Parents Network. June 2014: Kids and Animals: Tips on Picking the Perfect Kid-friendly Dog — Lactating Girl at The Adventures of Lactating Girl shares some tips she's learned on how to find the perfect child-friendly dog for your family. July 2014: Family Vacations: Our Week in Rome: Inspiration and Craft Ideas for Parents, Teachers, and Caregivers — If anyone in your family is interested in learning about Ancient Rome, if you enjoy crafts, of if you're a parent looking for a fun staycation idea, check out Erin Yuki's post for a Roman-themed week of crafts, food, and fun at And Now, for Something Completely Different. And Favorite Family Vacation Recipe: Staying at Home — The best family vacation Laurie Hollman at Parental Intelligence could ever recommend requires minimal packing, no hotels, unrushed travel, easy meals to everyone’s taste without a bill, no schedules, everyone’s favorite interests, and three generations playing together. August 2014: Friends: Snail Mail Revival — Skype isn't the only way to stay in touch with long distance friends, That Mama Gretchen and her family are breaking out the envelopes and stamps these days! And How I used the internet to make local friends — After years of striking out at the park, Crunchy Con Mom finally found some great local friends … online! September 2014: Home Tour: A Tour of Our Church — Garry at Postilius invites you virtually visit him in the 19th-century, one-room church where he lives with his spouse and two kids. And Our Life As Modern-Day Nomads — This family of five lives in 194 square feet of space — with the whole of North America as a back yard. Paige of Our Road Less Traveled guest posts at Natural Parents Network. November 2014: Indoor Play: Pencil, paper … bright ideas! — Marija Smits shares some ideas on how to make family ‘art and craft time’ inexpensive and fun. December 2014: Greatest Gifts: Gifts of love — Charlie at PeelingClementines recalls her favourite Christmas gift of all time and thinks about how to add this magic to her little one's first Christmas. Obviously there were many months that I could not choose just one favorite, there were so many fabulous posts this year. To see which posts my cohost, Dionna of Code Name: Mama, loved, check out her version of the 2014 Year in Review. 4HisGlory (On Facebook) (On Twitter) Participated in Carnival 1 month. A New Day (On Facebook) Participated in Carnival 3 months. The Adventures of Lactating Girl (On Facebook) (On Twitter) Participated in Carnival 2 months. All Natural Katie (On Facebook) (On Twitter) Participated in Carnival 1 month. Amy Willa: Me, Mothering, and Making it All Work (On Facebook) (On Twitter) Participated in Carnival 3 months. And Now, for Something Completely Different Participated in Carnival 2 months. Baby Giveaways Galore (On Facebook) (On Twitter) Participated in Carnival 1 month. Being Barlow (On Twitter) Participated in Carnival 1 month. The Boho Mama (On Facebook) (On Twitter) Participated in Carnival 1 month. Bread and Roses (On Facebook) Participated in Carnival 2 months. ChildOrganics (On Facebook) (On Twitter) Participated in Carnival 6 months. Cinnamon & Sassafras (On Twitter) Participated in Carnival 1 month. City Kids Homeschooling (On Facebook) Participated in Carnival 2 months. Code Name: Mama (On Facebook) (On Twitter) Participated in Carnival all 11 months. Crunchy Con Mommy (On Twitter) Participated in Carnival 2 months. Crunchy-Chewy Mama (On Facebook) (On Twitter) Participated in Carnival 2 months. Diary of a First Child (On Facebook) (On Twitter) Participated in Carnival 3 months. Earth Mama's World (On Facebook) (On Twitter) Participated in Carnival 1 month. The Earthling's Handbook Participated in Carnival 2 months. Eat Your Peas Participated in Carnival 1 month. Eco Journey In The Burbs (On Twitter) Participated in Carnival 2 months. Eco-Mothering (On Facebook) (On Twitter) Participated in Carnival 1 month. The Economama's Blog Participated in Carnival 1 month. Equipped (On Twitter) Participated in Carnival 1 month. The Erudite Mom (On Facebook) (On Twitter) Participated in Carnival 1 month. Friendly Encounters (On Twitter) Participated in Carnival 1 month. HannahandHorn (On Twitter) Participated in Carnival 1 month. Hobo Mama (On Facebook) (On Twitter) Participated in Carnival all 11 months. Hybrid Rasta Mama (On Facebook) (On Twitter) Participated in Carnival all 11 months. Joyful Courage (On Facebook) (On Twitter) Participated in Carnival 1 month. Kampuchea Crossings (On Twitter) Participated in Carnival 3 months. Leaves of Lavender Participated in Carnival 2 months. Life Breath Present (On Facebook) Participated in Carnival 3 months. Life With Lucien Participated in Carnival 1 month. Little Green Giraffe (On Facebook) (On Twitter) Participated in Carnival 2 months. Living Montessori Now (On Facebook) (On Twitter) Participated in Carnival 8 months. Living Peacefully with Children (On Facebook) Participated in Carnival 2 months. The Lone Home Ranger (On Facebook) (On Twitter) Participated in Carnival 2 months. LoveLiveGrow (On Facebook) (On Twitter) Participated in Carnival 2 months. Lydia's Handmade Life (On Facebook) (On Twitter) Participated in Carnival 1 month. Making My Own Magic Participated in Carnival 1 month. Marija Smits (On Facebook) (On Twitter) Participated in Carnival 3 months. Momma Jorje (On Facebook) (On Twitter) Participated in Carnival all 11 months. Mum in search (On Facebook) (On Twitter) Participated in Carnival 5 months. My life in a nut shell Participated in Carnival 1 month. Nurtured Mama (On Facebook) (On Twitter) Participated in Carnival 2 months. Our Mindful Life Participated in Carnival 9 months. Our Road Less Traveled Participated in Carnival 1 month. Panda & Ananaso (On Facebook) (On Twitter) Participated in Carnival 3 months. Parental Intelligence Participated in Carnival 7 months. Parenting Skills Participated in Carnival 1 month. PeelingClementines Participated in Carnival 2 months. The Pierogie Mama (On Facebook) (On Twitter) Participated in Carnival 3 months. Postilius Participated in Carnival 3 months. Project Procrastinot (On Facebook) (On Twitter) Participated in Carnival 1 month. Pug in the Kitchen (On Facebook) (On Twitter) Participated in Carnival 5 months. Radical Ramblings Participated in Carnival 1 month. Sand In My Toes (On Facebook) (On Twitter) Participated in Carnival 1 month. Savvy Parenting Support (On Facebook) (On Twitter) Participated in Carnival 1 month. Sophelia's Adventures in Japan (On Facebook) (On Twitter) Participated in Carnival 1 month. Surviving Mexico (On Facebook) (On Twitter) Participated in Carnival 4 months. sustainablemum Participated in Carnival 2 months. The Tales of Mother Goutte (On Twitter) Participated in Carnival 3 months. TEACH through Love (On Facebook) (On Twitter) Participated in Carnival 1 month. That Mama Gretchen (On Facebook) (On Twitter) Participated in Carnival 9 months. The Best Things Participated in Carnival 3 months. tinsenpup (On Twitter) Participated in Carnival 2 months. Together Walking (On Facebook) (On Twitter) Participated in Carnival 1 month. TouchstoneZ Participated in Carnival 1 month. Tribal Mama (On Facebook) (On Twitter) Participated in Carnival 3 months. True Confessions of a Real Mommy (On Facebook) (On Twitter) Participated in Carnival 1 month. Up the Dempster (On Twitter) Participated in Carnival 1 month. Vidya Sury, Going A-Musing, Collecting Smiles (On Facebook) (On Twitter) Participated in Carnival 1 month. Winegums & Watermelons (On Facebook) (On Twitter) Participated in Carnival 1 month. Your Fonder Heart (On Facebook) Participated in Carnival 1 month.